We'll be getting into the 3rd week of eSport @ St Luke's this afternoon and it's now time to start diagnosing how it's going. The numbers havs slowly dropped from an inital signup of 23 to 17 on the first week, then down to 13 on the 2nd week. Hopefully the dropouts are people who may not be up for the competitve elements of the sport, but I'll start to ask around this afternoon to see if there is anything that needs to be addressed. The next phase will be to also include other teachers to gauge their opinion on how it is progressing. Ideally it should be a sport that can stand in its own right without my pushing, as it certainly needs to do that once it gets out to other schools and other districts. I 'm also beginning to get some documentation together for how to set up Competitive Computer Games in a school environment so that the process will be as smooth as possible getting it through BDSSS. EDIT: I guess there wasn't anything to worry about, 20 showed for this week. One of the issues with developing virtual worlds is that the immersive qualities are not fully realised until the world is complete. Many of the tedious features like trees blowing, people going about their daily lives and having conversations away from the protagonist are usually not fleshed out until the main framework is complete. These add greatly to the realism of a scene, so they bring that feeling of 'being there' to life. With more ephemera there is more requirements on processing power and storage, to the point where systems can not cope with the amount of data on hand. In Computer Graphics there are level of detail (LOD) techniques to limit the complexity of a scene depending on the resources available. These techniques rate the importance of specific vertexes in a 3D model based on their ability to define the shape of the model. The tip of a nose is more important in defining facial features than vertexes representing slight bumps on the forehead. When rendering the model, vertices are drawn in order of importance so that limited resource systems still see the basic shape of the object (like the point of the nose) whereas more powerful systems can view extra detail (like the point of a nose and all the minor lumps on the forehead). With these techniques in mind, this model attempts to generate worlds based off events ordered by importance. Each event dictates a moment in space-time where an interaction occurs between different objects in the system. Very important events are generated first for large areas of this new world, then as the areas of space-time are broken into smaller and smaller chunks, new events are generated to flesh out the world. Each new event is deterministically created and constrained to abide by other events currently existing in the system. This enables a consistent, coherent world to be created no matter the starting position or the depth of processing available. With the ability to create virtual worlds at a whim, authors can then sculpt the world by placing specific events into the system while letting the event generation framework take care of everything else. Virtual Reality: An alternate reality where interactions from the present reality are transferred through to the alternate reality seamlessly. Although the term has become embedded into society as a phrase defining an immersive computer simulation (Okay, think "The Matrix" if you must), it also can be extended to other concepts. This immersive behaviour is not only limited to cars and such, as our own minds have been doing it for eons. To pick up a cup we send a signal to our arm to extend and, correlated by our eyes, be guided to the cup's position. Do we notice that we have to tell our arm what to do via electrical pulses? No. It is once again a seamless interaction where we think of the task in alternate reality terms instead of concentrating on the methods to achieve said task. U touch my Bottom ? I pulled out a shirt to wear a couple of weeks ago, an old Scripture Union shirt that I picked up from Sonfest a couple of years ago. It was purchased because there was a great singer on at the time, doing her first gig in 'the fridge' (an air conditioned tent; perfect for summer in Boonah) and I grabbed a shirt to get some signatures. After a bit of reminiscing about the great events of Sonfest, I decided to look up Nikki again to see if she'd produced any music yet. 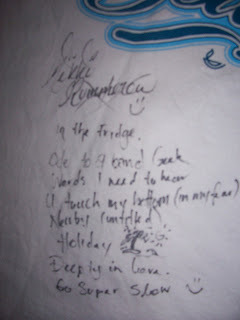 Sure enough, Nikkki Kummerow is out there in cyberspace, with the obligatory MySpace account for budding singers. I couldn't find any of the original songs lying around, but some of her new stuff has the same feeling behind it. Third Day were also in town (well, Brisbane, but close enough) over the Australia Day weekend and I'd snaffled some tickets as a Chrissy surprise for Sandy. Apparently hiding the CD with the tickets in the CD rack wasn't the greatest of spots as she found it 2 days later. Third day were great. 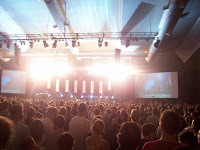 In an enclosed auditorium the music shifted up a notch over the other 2 Sonfest appearances I'd seen them at.